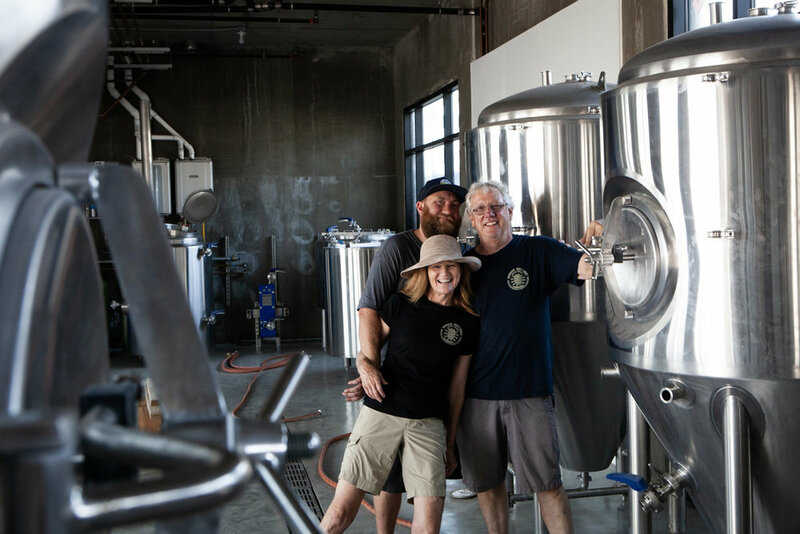 Burnin Daylight Brewing Company is a family owned and operated brewpub supported with a couple of friends, and a brew dog. It all started back in 2008 when brewer Brendan Lake, and his dad were home brewing on a regular basis. With the home brews coming out so enjoyable, Brendan decided to enter a home brew competition at Stone Brewing Company in Escondido. Brendan didn’t win the competition but did get an interview that following week and subsequently hired by Stone. From then on it was all uphill. After a couple years with Stone, Brendan decided to move back home to help put the South Bay on the craft beer map. During all of his brewing days, Brendan’s parents would repeatedly tell him to learn the business and maybe someday they would open their own brewery. Well that someday has arrived. Located in the heart of Lomita, AKA “The Friendly City”, Burnin Daylight will be the community craft beer place to go for all of Lomita. The team is made up of brewer Brendan Lake, and supported by his parents Bob and Shannon Lake. The tasting room will be headed by Matt Spanjol, and the whole team will be supervised by “Mac” the brew dog. Wanting to help put the South Bay on the craft beer map, Brendan, returning home from Oceanside, went to work during the start-up phase of the Dude’s as the “Cellar Dude”, moved on to Phantom Carriage during their start-up phase as an assistant brewer/head brewer, from there moved on to El Segundo Brewing Company and then Hop Saint Brew Co before brewing at Burnin Daylight. Guess you can say Brendan has done a good job helping to put the South Bay on the craft beer map. Matt Spanjol has worked at many local breweries pouring pints for all the thirsty patrons. Matt’s friendly face and craft beer knowledge will be there to pour you a fresh pint of beer and will explain how the beer was made for those so interested. And last but not least is the supervisor of the whole dang bunch, the brew dog “Mac”. You may not see Mac in the tasting room, but you can rest assured that he has been around keeping his eyes on all of them. Brendan’s Mom Shannon comes from an Irish family. The head of the family was better known as “Papa” and let’s just say that Papa enjoyed his Guinness. Papa would frequently stay at the Lake household and no matter how many Guinness’ he had the night before, the first thing everyone would hear the next morning was “Everyone Up, we’re Burnin Daylight”. Hence the name was born. Being of Irish descent the family toast is “Slainte”, meaning “Health”. So when you are enjoying a pint of freshly brewed beer in the tasting room don’t forget to raise your glass and toast your fellow resident with a “Slainte”, and remember you are “Burnin Daylight”.